The Vezelay Camino, Chemin de Vézelay in French or Via Lemovicensis in Latin, takes walkers from the vineyards of Burgundy in central France to the feet of the Pyrenees in the Spanish border. The route is a distance of 900 km from Vezelay to St Jean Pied de Port where you can join the famous Camino Frances. The pretty little medieval town of Vézelay in Burgundy is the starting point of this trail. 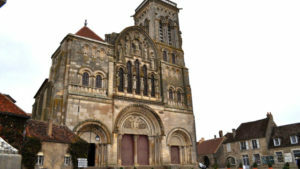 Vézelay has been a popular destination for pilgrims for many centuries, attracted by the shrine and relics of Mary Magdalene, reputedly kept in the town’s magnificent UNESCO-listed abbey. The Vezelay Way then takes pilgrims across the lush hills of the Limousin region, the gorgeous Medieval city of Limoges, the valleys of the Périgord and the plains of Aquitaine and the Landes. Your journey on the Vezelay Camino will take you to the Saint James Gate (Porte de Saint Jacques) as you enter the walled Basque town of Saint Jean Pied de Port. 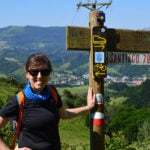 It is here where many of the Camino routes coming from France converge and where you can join the famous Camino Frances to continue on your way to Santiago de Compostela. The full Vezelay Way takes 39 nights to complete but we can break it into different stages for you that will take you along the route 1 week at a time. You will start your Camino from the Basilica in Vézelay, the town where King of France Philippe Auguste and King of England Richard Lionheart met to start the third crusade. Today you will cross the woods of the Yonne region and walk to la Maison-Dieu and Asnois before arriving in Amazy, where you can admire the old medieval houses. After Amazy, the Camino takes you again through woods and along small country tracks to arrive in Turigny where you should stop to visit the Gothic chapel and admire the lovely washing house. You will then be on your way to Cuncy-lès-Varzy, a lovely village with a 16th century church with stunning stained glass. Your destination and stop for the night is Varzy where you should visit the 13th century church of Saint-Pierre. Today, the Camino takes you mostly through forests and woodland. A few minutes after leaving Varzy you will encounter the chapel of Saint-Lazare surrounded by trees. After that, you will pass Bourras-l’Abbaye before reaching Chateauneuf-Val-de-Bargis, your stop for the night. The Camino takes you again today mostly across lush woods and pretty villages with medieval architecture to admire. In Murlin you should visit the 12th century Romanesque church of Saint-Martin. You will then cross the Bertranges forest up to Raveau before reaching La Charité-sur-Loire your stop for the night. Don’t miss the 12th century church of Sainte-Croix-de-Notre-Dame, a UNESCO World Heritage Site, in the lovely medieval old town by the Loire River. Today’s short Camino stage will allow you to explore La Charité-sur-Loire and relax by the Loire River. You will walk along fields, across woods and tiny hamlets before arriving in Sancergues where you should visit the 12th century Church of Saint-Jacques. A long, quiet and peaceful stage on the Camino awaits today, across fields and nature, perfect for reflecting and meditation. You will pass some pretty hamlets like Gron with its very unique church; Saint-Igny and Francheville before arriving in Brécy. King Charles VII used to live in the town’s castle, today in ruins. 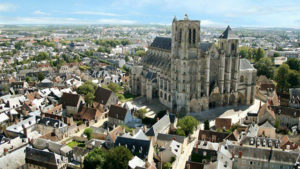 Your last walking day on the Vezelay Way takes you to the medieval city of Bourges. 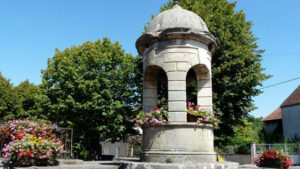 On your way, you can stop in Saintes-Solange to visit the 12th century church. 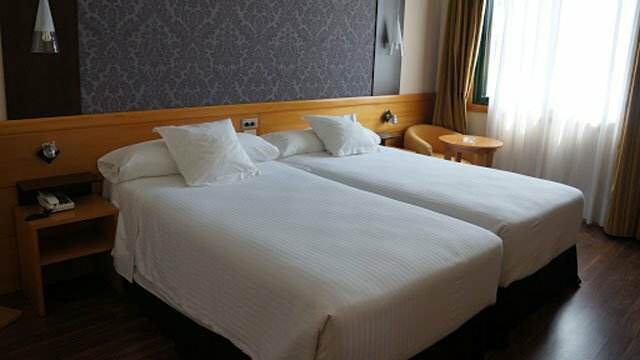 Once in Bourges, we recommend you visit the magnificent UNESCO-listed Gothic cathedral and the palace of Jacques Coeur, a rich merchant who wanted to build a beautiful and big house in his home town. You can also visit the museum of Berry, dedicated to medieval history and archaeology. Before returning home, make the most of your day in Bourges, exploring its medieval streets and visiting the 12th century Gothic cathedral, a UNESCO World Heritage Site since 1992. On your first walking day, the Camino leaves Bourges along a former Roman path that will take you to Chapelle-Saint-Ursin and its lovely 12th century church. You will then walk across the woods to reach Villeneuve-sur-Cher where you should visit the castle. Your stop for the night is the village of Chârost, where you will find a castle, church and old bridge. Wheat and rapeseed fields stretch for miles ahead of you on today’s Camino. On your way, you will reach Issoudun which was the most important city in the region back in the Middle Ages. Stop for a rest at the Church of Saint-Cyr, visit the pilgrim museum, the belfry and the 12th century white tower. In Thizay where you can visit the beautiful castle before continuing to Neuvy-Pailloux, your stop for the night. Today you will notice a change in the landscape and you will cross mainly fields and woodland. Tonight your will spend the night in the beautiful little town of Chateauroux on the banks of the River Indre. It is the second largest town in the province of Berry after the town of Bourges. Must see attractions include Chateau Raoul, dating back to the 15th century and to which the town owes its origin. Another key attraction includes the Church of Saint-Andres which at night is illuminated making it a spectacular sight that’s not to be missed. Today, the Vézelay Way takes you past lakes and through peaceful woods. You will start your walking day crossing a splendid deciduous woodland on your way to Argenton-sur-Creuse. You will pass through the little village of Velles and from there the path meets and for a time follows the River Bouzanne as it meanders through the tranquil French countryside. Argenton-sur-Creuse will be you destination for today, a lovely little town on the banks of the River Creuse. While your in the town you should follow the stepped path up to the little chapel of of Bonne Dame from which you can overlook the town and its surrounding landscapes. After Argenton-sur-Creuse, the Vézelay Way takes you through peaceful farmland and meadows filled with grazing cows. You will follow the River Creuse upstream through the little village of Le Menoux. Your stop for the night is Gargilesse with its lovely castle. You should also visit the church of Notre-Dame and the house of famous writer George Sand. The Creuse River shows Camino pilgrims the way today. On your way to Crozant, you will pass several hamlets and green pastures before arriving in Cuzions’ beautiful village square. You will cross the bridge of the Piles over the Creuse River to continue on to Éguzon and some hamlets before reaching Crozant. Crozant is your stop for the night. Here you can visit the little church and the ruins of the former castle, listed as National Heritage Site by the French Government. Leaving Crozant, the Camino then follows the Sédelle River up to the Charraud bridge. Stop to have a look at the church in Chapelle-Baloue before continuing to Saint-Germain-Beaupré and the castle that hosted former King of France Henry IV. This Camino de Santiago stage ends at La Souterraine where you can visit the 12th century church, the Bridiers Castle and the Saint-Jean Gate. Fields, meadows and woodlands make most of today’s landscape on the Camino. You will be also passing the lovely villages of Saint-Priest-La-Feuille and Chamborrand before reaching your stop for the night: Bénévent-L’Abbaye. At Bénévent-L’Abbaye you can visit the country museum, and the 12th century church, listed as National Heritage Site by the French Government. Today the Camino starts with a slightly hilly trail through woodland. In Saint-Goussaud, the lanterne des morts (lantern of the dead) as you enter the village reminds pilgrims of all who have walked this Camino path since Medieval times. Continuing across the woods you will reach Saint-Laurent-les-Églises and the beautiful bridge of Dognon. Today’s stage is quite short. At Le Châtenet-en-Dognon you can admire the 12th century church, with a very unique style for this region. Your final point for the day is Saint-Léonard-de-Noblat and its magnificent collegiate church, listed as a World Heritage Site by UNESCO. Explore this lovely town, where you should definitely see the bridge and medieval houses in the old town. Today is your last day walking the Vézelay Way. After you leave Saint-Leonard-de-Noblat you will be following Vienne River walking peaceful paths before crossing the Saint-Etienne bridge to enter the old city of Limoges. In this fascinating and beautiful medieval city you should definitely visit the wonderful cathedral, the ‘cour du Temple’ (inner courtyard) with its timber frame houses and the many little chapels and churches. Explore the small city of Limoges before you finish your Vézelay Way trip. Must-see spots include the cathedral, the remains of the Gallo-Roman amphitheatre, the picturesque Rue de la Boucherie with its timber houses, as well as the many chapels and churches in the old town. You will start your Camino walking Limoges’ medieval streets before reaching the countryside where you will follow paths drawn into the hills called ‘poudges’ locally. At Aixe-sur-Vienne we recommend you visit the lovely 15th century Losmonerie Castle. You will encounter many Madonna statues erected all over the town. From Les Cars, the Vézelay Way takes pilgrims straight into the beautiful countryside of the Périgord Limousin Regional Natural Park. The village of Bussière-Galant, part of the natural park, is your only interruption until you reach La Coquille, your stop for the night. At La Coquille, you should visit church of Saint-Joseph and the La Meynardie castle. A very pleasant and varied walk awaits today, as you follow the ancient paths taken by pilgrims to Santiago de Compostela for centuries. This is also the route taken by Napoléon in 1815 on his return from Elba. You will arrive in pretty Thiviers where you will find the church of Notre-Dame, inspired by the Church of San Isidoro in León (on the French Way Camino route). 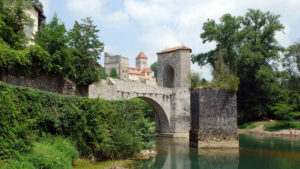 You should also explore the lovely medieval old town with its timber frame houses and the 16th century Vaucocour castle. A very short and easy walking stage today so you can take your time, relax and enjoy the pleasant countryside on your way to Sorges. Foodies can visit the eco-museum dedicated to the truffle which is a regional speciality. The church of Saint-Germain is listed as National Heritage Site by the French Government. From Sorges, the Camino continues across wheat fields to Cornille, where you should visit the beautiful 12th century church of Saint Eumache and a little castle in the forest before arriving in Périgueux. The cathedral of Saint-Front, a World Heritage Site by UNESCO, the church of Saint-Martin de Périgueux and the tower of Vesone are all must-see spots in this pretty town. 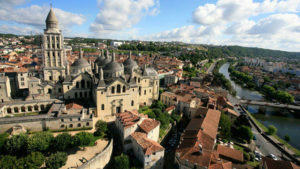 Périgueux has a rich heritage you should explore before finishing your Camino adventure. You could start with the Art and Archaeology Museum or the Gallo-Roman Museum Vesunna. Wander the town’s medieval streets to take in the quaint architecture and don’t miss the Saint-Front Church, the Mataguerre Tower or St Etienne Church. On your first walking day, the Camino takes you out of Périgueux and quickly reach the 10th century Romanesque abbey of Chancelade, listed as National Heritage Site by the French Government. After the abbey, the trail takes you through the woods. Your destination and stop for the night is Saint-Astier where we recommend you visit the local church and the grand Puyferrat castle. Today’s stage on the Vézelay Way will follow the river mainly, taking you past hamlets and villages where you can stop for a rest and admire the region’s traditional architecture. The last part of the day, you will be walking across pleasant pine woods, a classic feature of the Landes region. Mussidan is your destination for today. Once you reach the town, dissected by the river, you can take a break in the town park and explore the pretty centre. After Mussidan, the Camino continues through pine forests and lonely farms. At Montfaucon, you can have a rest and visit the church, before continuing your walk through vineyards all the way to Sainte-Foy-la-Grande, your stop for the night. At Sainte Foy, take time to explore the old town with its picturesque timber frame houses and visit the Notre-Dame church. Today, the Camino leaves behind the Dordogne River and takes pilgrims along the region’s vineyards again. You will be entering the region known as ‘l’Entre-Deux-Mers’ (between two seas). At Pellegrue, we recommend you visit the castle and small church. Your destination for today is the hamlet of Saint-Ferme, with its 12th century abbey. After Saint-Ferme, you will soon reach the villages of Monségur where you can visit the local church and old town and Saint-Hilaire-de-la-Noaille before getting to La Réole, your stop for the evening. Richard the Lionheart erected some wonderful halls in this town. The cloister of Saint-Pierre and the old timber frame houses are also a must-see in the historic centre. Today, the Camino takes you along the Garonne River until you reach the tiny and pretty village of Pondaurat, built and developed by religious orders over the centuries, where you will find the Saint-Antoine church and monastery. Another charming village in today’s route is Auros. Your stop for the evening is Bazas with its magnificent UNESCO-listed cathedral, and lovely main square and city hall. Today, the Vézelay Way enters the Landes region and takes pilgrims across peaceful pine forests. In Beaulac, we recommend you visit the pretty church and take a break by the river. Your destination for today is Captieux. A long walking day lays ahead today, however, the Camino takes you mostly across peaceful pine forests, ideal for a bit of reflection or meditation. 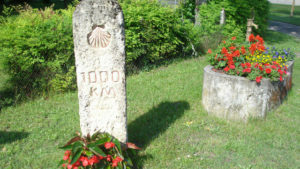 At Retjons, spot the Camino de Santiago milestone, indicating it is only another 1000kms to Santiago de Compostela! Stop and have a rest at the lovely chapel of Lugaut, located in the heart of the forest, before you continue your walk to Roquefort, where you will find another National Heritage listed church: Sainte-Marie. Take some time to explore Mont-de-Marsan with its timber frame houses and medieval chapels. The airbase in the town is home to the French Air Force. The starting point for your first day walking on the Vézelay Way is the old town in Mont-de-Marsan. 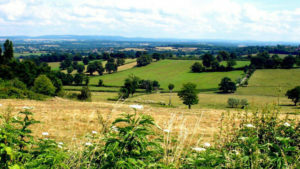 Today you will be walking in peaceful countryside, passing farms, villages and woodland. In the village of Benquet, we recommend you stop to visit the 12th century church of Saint-Christau. After crossing the Adour River you will finally reach Saint-Sever, your stop for the night. You shouldn’t miss the magnificent abbey, listed as a UNESCO World Heritage Site. Today you have a short walking day ahead, you so you can tame your time and visit the local sights along the Camino. In Audignon, you should visit the 12th century Romanesque church. You should also visit the Gothic Church of Saint-Martin in Horsarrieu, listed as a National Heritage Site. Your destination for today is the town of Hagetmau, where we recommend you visit the impressive 12th century crypt. A long walking day on the Camino awaits. You will set off from Hagetmau and soon reach the countryside to continue your Camino among vast corn fields. You will have the magnificent Pyrenees and its snowy peaks ahead. Today you will also reach the wonderful bridge of Pont-Vieux taking you into Orthez, where you should admire the Moncade tower. It is the last tower remaining of the castle built here in 1242. Explore the pretty medieval city and visit the church of Saint-Pierre. Today you will get a chance to visit a museum dedicated to the Camino de Santiago in the village of Saint-Palais. It is here where pilgrims following the Le Puy Way, the Vezelay Way and the Paris & Tours Camino route all join to continue on the same path from now on. You will need to climb to reach Soyarza but the views will be outstanding. From here the Camino takes pilgrims through Harambeltz, with its pretty church with murals and superb Romanesque portal; before finally descending into the lovely village of Ostabat (Izura-Azme in Basque). Your last walking day on the Vézelay Way will take you across lush green valleys, meadows packed with grazing sheep and several hamlets before finally taking you through the St James Gate and into the walled town of Saint-Jean-Pied-de-Port. This pretty red and white Basque town is the starting point of the famous French Way or Camino Frances. Admire the Gate of Notre-Dame, the Rue d’Espagne, where you will find houses dating back to the 16th century and the citadel. 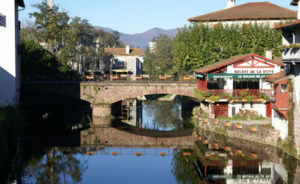 Saint-Jean-Pied-de-Port is the second most popular starting point for Camino pilgrims. 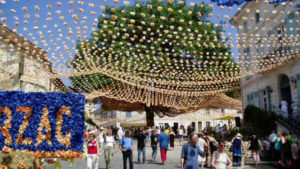 20,00 people per year choose to start their Camino here and take the opportunity to explore this beautiful walled town where many Camino routes coming from France converge. Paris Charles de Gaulle Airport 252km: From the airport to Paris Gare Bercy (station), take the bus line 4 (to Gare de Lyon), departing every 30min (travel time 15min). From this station, you can take the metro (line 14, towards Olympiades) to Bercy (2min). From here, it is one block walk to the train station. It is also possible to walk from Gare de Lyon: it would take you approx. 10min. See www.aeroportsdeparis.fr. Paris Orly Airport 218km: From the airport to Gare Bercy, take the shuttle bus from the airport to Pont de Rungis, then the metro (line 10) to Bibliothèque François Mitterrand and then metro (line 14) to Gare Bercy. See www.aeroportsdeparis.fr. From Paris Gare Bercy there is a train to Sermizelles (up to 5 times/ day, taking approx 3h). Depending on the time, the route is direct or needs a change (with a change in Cravant, Laroche Migennes or Auxerres). Sermizelles is 11km from Vezelay. From Sermizelles you can take the bus (taking 15min). See www.voyages-sncf.com for the trains and buses (SNCF buses). Alternatively you can take a taxi for the last stretch of the journey. Another option is taking a train to Avallon (trains are more frequent), which is 16kms away. From Avallon you will need to take a taxi to Vezelay. Paris Charles de Gaulle 270km: From the airport to Paris d’Austerlitz station: take the RER train from the airport to St. Michel (Notre Dame) (45min travel time). From here take the metro (line 10) to Paris d’Austerlitz (10min). See www.aeroportsdeparis.fr. Paris Orly Airport 239km: From the airport to d’Austerlitz: take a shuttle bus to Pont de Rungis, then the metro (line 10) to the station. www.aeroportsdeparis.fr. Lyon Airport 300km: Take the Rhonexpress (shuttle train) from the airport to the city centre and train station (Lyon Part Dieu) (every 15min, approx. 30 min travel time). See www.rhonexpress.fr. From Lyon (Part Dieu) you can take a direct train to Bourges (3 times/ day, approx. 4h). Non-direct trains also available. See www.voyages-sncf.co.uk. Limoges-Bellegarde Airport 10km: There is no public transport from Limoges airport, but there is a special taxi service: See www.aeroportlimoges.com. Paris Charles de Gaulle Airport 415km: From the airport to Paris d’Austerlitz: take the RER train to St Michel (Notre Dame) (45 min approx travel time), then take the metro (line 10) the station. See www.aeroportsdeparis.fr. Paris Orly Airport 383km: From the airport to Paris d’Austerlitz: you can take the shuttle bus to Pont de Rungis and then the metro (line 10) to the station. See www.aeroportsdeparis.fr. There are direct trains Paris (Gare d’Austerlitz) to Limoges (Benedictins) at least every 2 hours (3h-3h30 travel time). See www.voyages-sncf.com. There are trains from Bordeaux (Gare St.-Jean) to Limoges (Benedictins) 3 times/ day direct (or more often with a change at different stations). Travel time is approx. 3h. See www.voyages-sncf.com. Bordeaux Airport 130km: From Bordeaux Airport you can take a shuttle to the station (Gare St.-Jean) (every 45min, travel time approx. 20min). See www.bordeaux.aeroport.fr. From Bordeaux (Gare St.-Jean) you can take a train to Perigueux, every 2 hours/ day. Travel time is approx. 1h30. See www.voyages-sncf.com. There is a train between Limoges (Benedictins) and Perigueux at least every 2 hours/ day. Travel time is 1h-1h20. See www.voyages-sncf.com. Bordeaux Airport 130km: From the airport to Bordeaux Pessac station you can take a shuttle (travel time approx. 20min). Seewww.bordeaux.aeroport.fr. There is a train to Mont de Marsan from Bordeaux Pessac. 1h20 travel time approx. See: www.voyages-sncf.com. Pau Airport 80km: There is an airport shuttle bus to the train station every hour (except Sundays and public holidays). See www.pau.aeroport.fr. There is a bus from Pau (Gare) to Mont-de-Marsan (Gare)(1-4 times/ day, depending on the day). See: www.tourinsoft.com. Biarritz Airport 55km: You can take a bus from St Jean Pied de Port to Bayonne Gare (station) five times a day (approx. 1h20). From Bayonne Gare you can take a shuttle bus to Biarritz Airport (25 min approximate travel time). See www.voyages-sncf.com and http://en.biarritz.aeroport.fr/. The is also a train from St Jean Pied de Port to Bayonne. Alternatively, you can use a private shuttle bus service to Biarritz airport, please check: www.biarritzairporttransfers.com (Prices depend on group size); or contact the team for airport transfers. Pau Airport 90km: There is a train connection to Pau from St Jean up to 5 times/ day (not on Sunday), with a change in Bayonne. Travel time is about 3h-5h, depending on the time you need to wait in Bayonne. See: www.bonjourlafrance.com/. From the train station in Pau, you can take the airport shuttle bus, departing every hour (except Sundays and public holidays). See: http://www.pau.aeroport.fr/.